Invite the people you care about and celebrate a cozy weekend at our place and spoil yourselves in our house.Dinner at the Inn next to us which is only 10 meters away so that you do not have to drive home after a lovely dinner for cheap prices. Rent the whole house for a very cheap price compared to hotels or pensions prices. Arrival Friday evening where the host makes a short introduction about the weekend meanwhile coffee and pastry is served in our lounge. A big breakfast awaits you in our cozy café. Take a trip in the exiting Schleswig Holstein area and take a picnic basket with you full of sandwiches, beers or soft drinks that we have prepared for you so you can enjoy it in the beautiful landscapes. At arrival in the evening there awaits you a feast banquet for dinner at the inn next to us. You can also get the dinner served at our house if you want to dine there instead at the innt. The rest of the evening you can celebrate in our cozy lounge were against surcharge a free bar can be arranged with self-service. A big breakfast awaits you in our cozy café before you depart for your home destination. All above mentioned for 25 guest only costs 2900 Euro or 40 guests costs 3900 Euro. 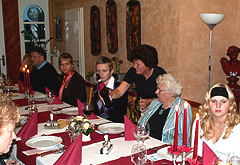 or family celebration at only 950 Euro per night incl. breakfast.